Bramble and Thistle, with their owners Laura Graham and Jane Rutherford, hand over the proceeds of their book to Dunbar RNLI. Two East Lothian dogs have raised £2,800 for Dunbar Lifeboat Station by starring in their very own children’s book. Bramble the Bedlington terrier and Thistle the Border terrier inspired the children’s story Bramble and Thistle, written and illustrated by the owners of the dogs, Laura Graham and Jane Rutherford, both teachers at Belhaven Hill School in Dunbar. Laura’s children’s story was then brought to life by Jane’s watercolour illustrations. Working with the Royal National Lifeboat Institution’s head office in Poole in Dorset, Laura and Jane created an adventure story about the two dogs to entertain children and, at the same time, educate them about safety at the seaside. 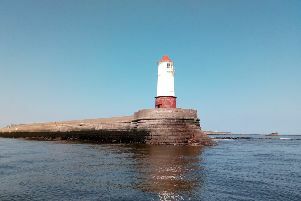 Dunbar is the backdrop for the story, and recognisable locations such as Dunbar Harbour, Belhaven Bay and Bass Rock feature in the tale of two dogs. The 500 copies printed flew off the shelves, and it was sold out in a matter of weeks, but there is now talk of a rerun to cope with demand. Laura said: “Jane and I were delighted with the success of the book. The RNLI team in Dunbar were very supportive of our project, and it has been a wonderful experience to see the story come to fruition and sell so well. Many thanks to the shops that helped us to raise a fantastic total.